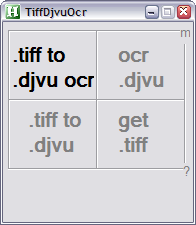 GUI frontend to convert Scan Tailor tiff output to a OCR'ed, searchable djvu file. Only tested in Windows XP. Old software, not tested in Windows 10 or with latest version of Tesseract. The OCR step can in some cases miss a character which makes all subsequent OCR words one character off. That bug needs fixing for this tool to be fit for use again. Drag drop a file on a command. outputs an OCR'ed, searchable .djvu file. 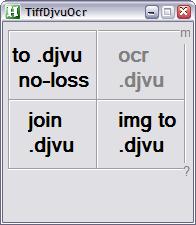 v110305 New commands: to .djvu no-loss , join .djvu , img to .djvu; Autohotkey_L compatible.